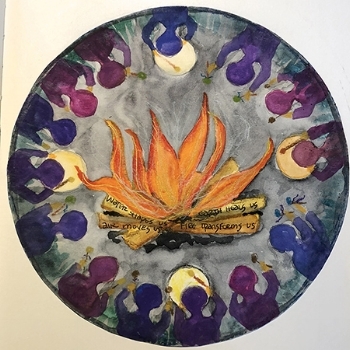 Discover your connection to divine around a Sacred Fire. Monthly community and women's fires, and other special events and ceremonies are held at the Olympia Sacred Fire House. 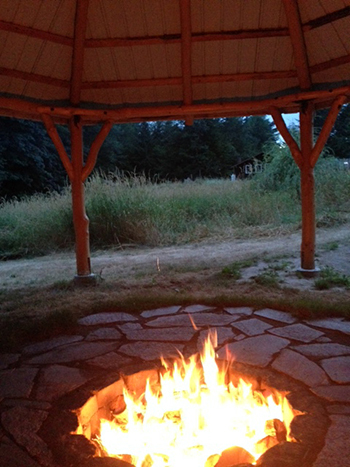 Nestled on ten acres only minutes from I-5, Sacred Fires offer a relaxing escape into nature. Attending a sacred fire ceremony at the Olympia Sacred Fire House is good medicine. Re-awaken your connections with heart, nature, courage, healing and community that will guide you through your days. Scroll down for details about all upcoming events. Subscribe to the event newsletter to receive location, directions and event announcements. Experience a simple ceremony that opens ritual space so the warmth and wisdom of Grandfather Fire can light your life and awaken your heart. Community fires generally last 3-4 hours. The women's sacred fire dives deep with ceremony, drumming, dreaming and sharing from the heart. This fire is hosted by Peter's wife, Sharon, who is an initiated Sacred Fire Community Fire Keeper and Nahua Granicera (Weather Worker). Questions? Contact Sharon at 360-561-8773. Full moon fire dates may vary from dates shown on your calendar. It's best to confirm with a phone call or subscribe to the newsletter. What does it mean to be a man? Society often presents the masculine from the mind's perspective, including cultural norms and mixed messages that can create confusion and insecurity about how to act and react as a man. Coming to the Men’s fires allows us to explore going into our hearts to see the male role from a deeper perspective. What is shamanic healing? How is it similar to other energetic healing modalities? How is it different? This fire is open to everyone. Your questions will help guide the conversation about the sources of illness and disease, the roots of ancestral shamanism, and how physical, emotional and spiritual expressions are shaped by the world around us. Come to the Fire and join with others as we learn and deepen our ability to work with the mysteries in our lives. June's Solstice is the fullest manifestation of Summer's seasonal energies. The Sun will pause in its travels for three powerful days before shifting the cosmic energy toward growing darkness. This pinnacle of fullest light holds a special potential for blessings as the season of "outward energies" comes to completion.